This blog post welcomes back SB with more Garden Clippings from her garden on the banks of the River Stour, with more wonderful insights into the wildlife living on the river. The much-needed rain finally came. The water butts have filled up and the hosepipes are stored away in the garden shed. The lawns seem to be growing at such a pace, making up for lost time perhaps! The weeds are following suit. 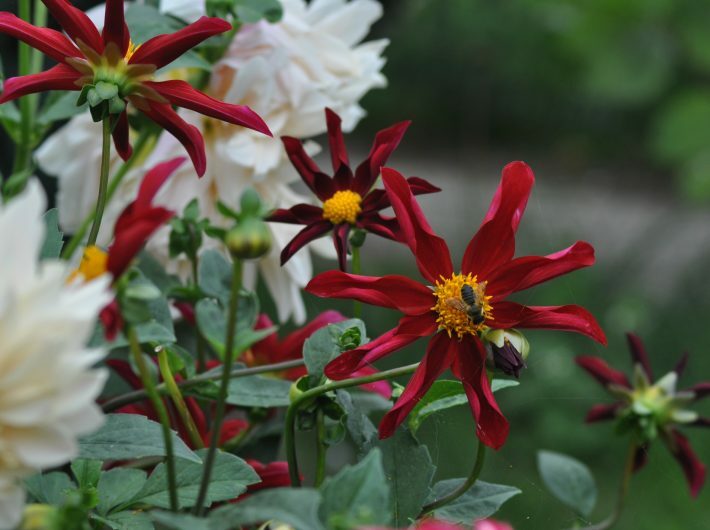 My dahlias are now blooming joyfully and add a splash of colour to the vegetable garden. I do have a problem with large numbers of earwigs inside and eating the flowers this year though. I have added a few upside-down flower pots stuffed with straw on bamboo canes, in the hope of luring them away from the flower heads. The duck weed has now started to disperse. The kingfisher is once again regularly seen back on his favoured spot in the millpool sitting on a branch of the fallen willow, two or three feet above the surface of the water. One must always pause and enjoy the fleeting spectacle of this fabulous bird. 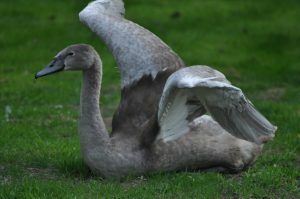 The five cygnets are now fully grown and are displaying hints of a paler hue in their plumage. Four remain together, usually with an adult but one is bolder and is often seen asleep, alone, on the back lawn while the others are elsewhere. Yet another brood of moorhens are scuttling about! The surviving member of the last brood is now independent. There are four chicks, still very tiny and one looked very poorly a couple of days ago. It was plaintively calling and extremely weak, unable to stand, when I spotted it on the back lawn. The mother did come to it and was fussing around but whether she managed to revive it with food or not I do not know. Sadly, I fear not. My greenhouse is full of tomato plants and peppers. The tomato crop has been the best I have ever had and there are still many more hopefully to ripen. They are all cherry tomatoes. Outside in one of the raised beds I have grown some plum tomatoes which are producing a good crop. I noticed that one or two of the greenhouse tomatoes had been partially eaten and then I spotted the culprit – a large caterpillar residing in a leaf. It is the caterpillar of the Bright-line brown-eye moth, also known as the tomato moth. With such a large crop I was happy to share the bounty with the caterpillar!